Butterfly Sciences has two granted patents for flow cytometry available for license. There are a number of areas that flow cytometry assays have problems with which throw off results. In a nutshell, not all beads are the same size, there is random carryover of large slugs of beads, and flow cytometry is a system for generating variance in sample counts for different bead sets. There are other issues, such as dimer beads sometimes getting through gating, and significant variation in the sensitivity and dynamic range of photomultiplier tubes used. Butterfly Sciences can provide consulting to assay developers on how to create more robust assays. In flow cytometry, microbeads with an assay (such as an ELISA) on the surface are mixed with a sample (for instance blood serum), washed, and then sucked up by a metal pipette into the flow cytometer. Beads are pumped into the flow cell, while sheath fluid is circulated at a higher rate of flow. This creates a stream that picks off roughly one bead at a time into the nozzle. 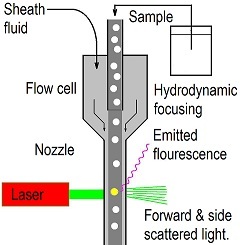 Beads flow past a laser, and if they have responded to the assay, fluoresce. The fluorescence is picked up by a photo-multiplier tube, which judges intensity of signal. The intraplexing method is used in flow cytometry to make diagnostic assays more reliable and precise. It makes use of multiple microbead sets for the same assay to obtain greater reliability. This method is more complicated, and makes use of antibodies that have variable affinity to their antigen on different bead sets. Butterfly Sciences has developed other intraplexing methods that are simple to use.